In the last blog Introduction of Hadoop and running a map-reduce program , i explained different components of hadoop, basic working of map reduce programs, how to setup hadoop and run a custom program on it. If you follow that blog you can run a map reduce program and get familiar with the environment a little bit. Before starting this post i recommend to go through the previous post once. The purpose of this post is to go a little deep and describe how YARN works and how it is better from previous Hadoop 1.0 environment. Then we will look into some configuration files using which we can manage hadoop environment better. We have discussed about HDFS and Mapreduce. Here i am explaining architecture and working of YARN in detail. YARN was introduced in Hadoop 2.0. 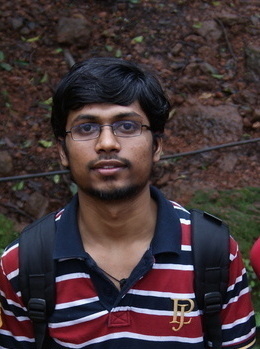 In Hadoop 1.0 a map-reduce job is run through a job tracker and multiple task trackers. Job of job tracker is to monitor the progress of map-reduce job, handle the resource allocation and scheduling etc. As single process is handling all these things, Hadoop 1.0 is not good with scaling. Also it makes Job tracker a single point of failure. In 1.0, you can run only map-reduce jobs with hadoop but with YARN support in 2.0, you can run other jobs like streaming and graph processing. In 1.0 slots are fixed for map and reduce tasks so while map is running you can’t use reduce slots for map tasks because of that slots go waste, in 2.0 there is a concept of container, which has resources like memory and cpu-cores and any task can be run in it. It has two main component: Job Scheduler and Application Manager. Job of scheduler is allocate the resources with the given scheduling method and job of Application Manager is to monitor the progress of submitted application like map-reduce job. It has all the info of available resources. For each node there is a node manager running. It maintains the available resources on that particular node and notifies Resource Manager about the available resources when it starts. It launches the containers by providing the needed resources (memory, cpu etc.). These resources are allocated to container by Resource Manager. It manages the containers during it’s lifetime. It sends heartbeat to Resource Manager to let it know that it is alive. In case Resource Manager doesn’t receive heartbeat from Node Manager, it marks that node as failure. It carries out the execution of job using different components of YARN. It is spawned under Node Manager under the instructions of Resource Manager . One Application master is launched for each job. 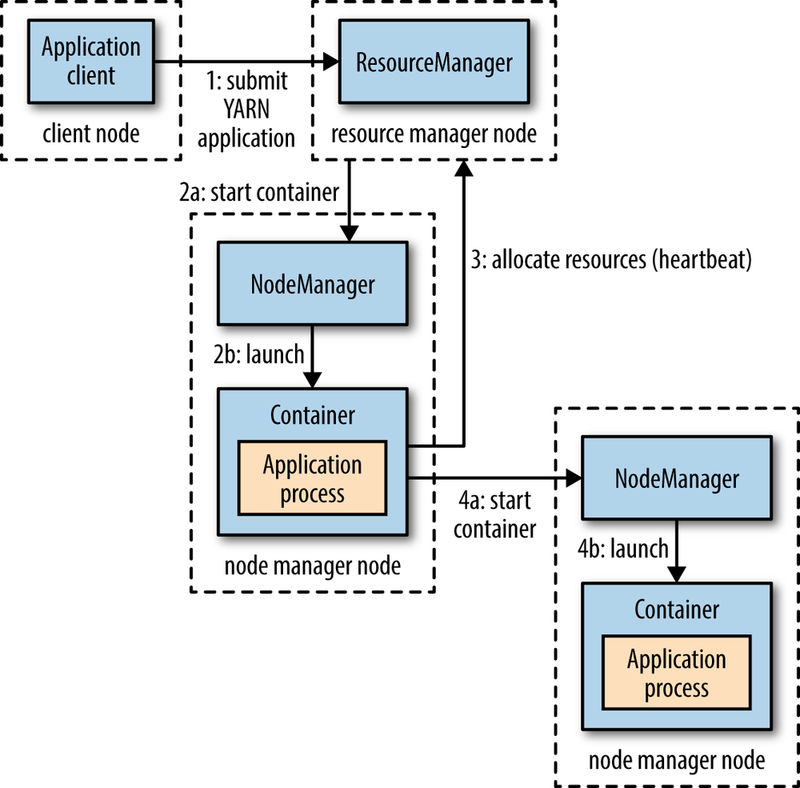 For resource allocation it talks to Resource Manager, for launching or stopping a container it talks to Node Manager. It aggregates the status of task from different nodes and notifies the status of job to client as client polls on it. It also sends periodic heartbeat to Resource Manager to make sure Resource manager can launch a new Application Master in case of failure. It is started by Node Manager. It consists of resources like memory, cpu core etc. For running a map or reduce task, Application Master asks Resource Manager for resources using which a container can be run. User submits jobs to Job Client present on client node. Job client asks for an application id from Resource Manager. Job which consists of jar files, class files and other required files is copied to hdfs file system under directory of name application id so that job can be copied to nodes where it can be run. Job is submitted to Resource Manager. Resource Manager contacts Node Manager to launch a new container and run Application Master in it. Application Master checks the splits (usually blocks of datanode of hdfs) on which job has to runs and create one task per split usually. Only ids are given to all the task in this phase. It checks if all the tasks can be run sequentially on same JVM on which Application Master is running then it doesn’t launch any new containers. This type of job is called uber job. If job is not an uber job, Application Master asks Resource Manager for allocating the resources. Resource manager knows after node manager hdfs blocks and their bandwidth, so it allocate resources considering the data locality so that tasks can be run on same machine on which data blocks are present. Application manager gets the resources information from Resource Manager and it launches the container through Node Manager. In container the task is executed by the java application whose main class is YarnChild . Before running the task it copies all the job resources from hdfs. In most of the cases, job programs which is usually in jar form are copied to machine on which data is present. Task sends progress update to Application master time to time. In case of failure Application master can launch the task on some other container. In case of run time exception JVM reports to Application master and in case of JVM failure Node manager notifies Application Master. I checked some logs of Client, Resource Manager and Node Manager on submitting a job. These might also give you some idea about the working of YARN. HADOOP_HEAPSIZE : Memory processes like Application Master/ Resource Manager/ Node Manager / Datanode etc. should take. Set environment variable that are used in script to run MapReduce. Overrides settings set by hadoop-env.sh. Configuration settings for namenodes and datanodes. You can check the progress of a Job through web interface on http://127.0.0.1:8088 . You have to expose this port if you are running hadoop through docker. Please check the previous post for this.